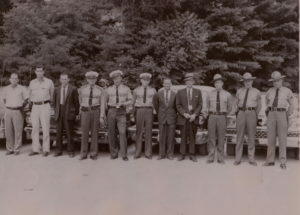 This photograph shows the Mitchell County Law Enforcement team about 1960. Pictured, left to right, are James Edwards and Joe Stewart, Mitchell County deputies; Sam Gouge, Mitchell County Sheriff; Jim Burleson, Spruce Pine Chief of Police; Ray Gunter and Landon “Cotton” Burleson, Spruce Pine Police Department officers; Herb Teague, Spruce Pine Police Department detective; Zeke Howell, Mitchell County Jailer; and North Carolina Highway Patrolmen Charles Radcliffe, R.E. Pipes, and Lee Lance. The automobiles, left to right, have been identified as a 1960 Ford, a 1960 Pontiac, a 1959 Chevrolet, and a 1959 Ford.